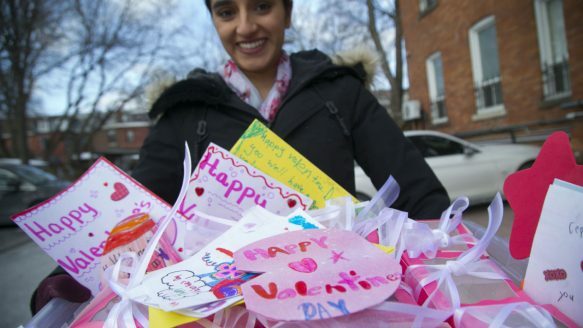 The Sikh Students’ Association responded to racist posters with an event promoting education and awareness. The group, along with the University of Alberta Students’ Union and the World Sikh Organization, hosted Turban Eh! on Tuesday at the U of A. Last week, at least a dozen racist posters were put up around campus, displaying the image of a Sikh man in a turban with a profane headline and xenophobic message. The University of Alberta Students' Union building was a sea of multi-coloured turbans on Tuesday in a broad-based show of support for the Sikh community. 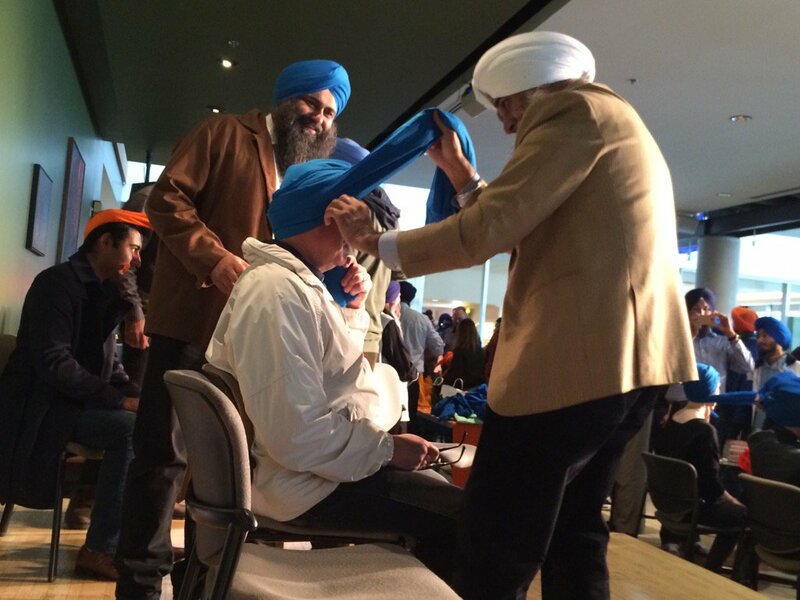 The turban-tying event called "Turban, Eh?" invited anyone to get a turban tied on their heads. 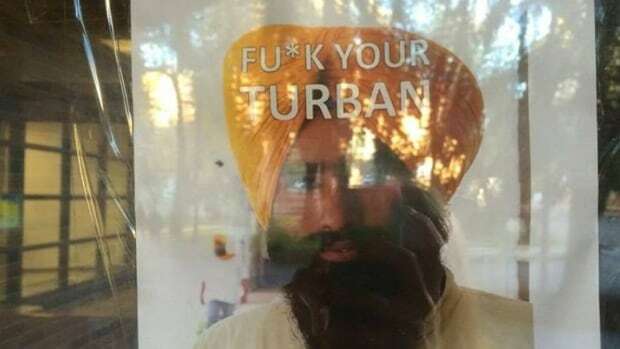 It followed the discovery of a racist poster on campus last week that pictured a turbaned man of the Sikh faith and the words, "F--k your Turban." Edmontonians are taking a disturbing incident and turning it into an opportunity for education and awareness. “In response to the current event that happened at the University of Alberta, the Sikh Students Association/Students Union/World Sikh Organization present to you Turban Eh! Come say hi and get your Turban Tied,” Gurjot Sandhu posted on Facebook. The event is scheduled for Tuesday, Sept. 27 at the U of A Students Union Building stage from 11 a.m. to 2 p.m. When Al Sahn saw the poster on his way to class, he couldn't help but rip it off the wall. It pictured a turbaned man of the Sikh faith. Above the photograph, in bold letters, it read "F---k your Turban ... If you're so obsessed with your third world culture go the f---k back to where you came from!" The hashtags, "Non-Integrative" and "Invasion" were also on the poster. Sahn found it taped to the door of the Rutherford Library on the University of Alberta campus. It was just one of several racist posters discovered across the Edmonton campus on Monday. 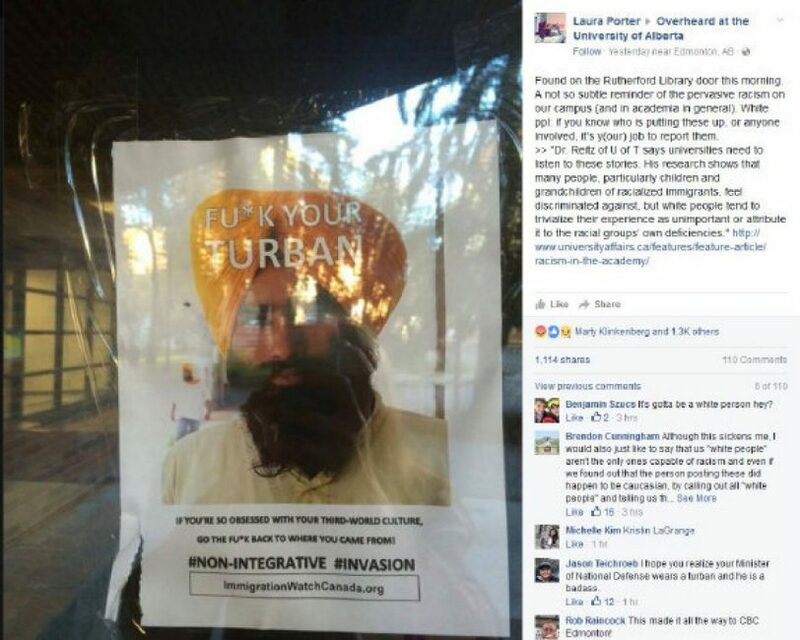 Prime Minister Justin Trudeau is adding his voice to growing condemnation of racist posters that were put up at the University of Alberta targeting turban-wearing Sikhs. “We’re proud of the enormous contributions Sikhs make to this country everyday,” Trudeau wrote Tuesday on Twitter. The university said it removed 12 of the posters found on the campus on Monday, including one at the university’s main library. The Liberal government is facing pressure to keep the Office of Religious Freedom open, after representatives from three influential faith groups wrote Foreign Affairs Minister Stéphane Dion on Friday asking him not to scrap it. The open letter from organizations representing Jewish, Sikh and Ahmadiyya Muslim Canadians underscores the potential political cost of shuttering the three-year-old office, which the previous Conservative government established with much fanfare.